They go above and beyond to provide excellent service! I would recommend this place hands down! You are more than a mouth to put braces on for them, they make you feel like family! This place is awesome! Every time we visit or call, the staff is positive, professional, and friendly. They have made my daughter feel special and well cared for every step of the way. Her braces came off today and the results are amazing! I wouldn’t take my kids anywhere else. This is absolutely without a doubt the BEST orthodontic practice for your child and/or your orthodontic needs!!!!! I have driven over an hour for two years for both of my children to receive the most meticulous and precise care!!! The entire team from check-in to Orthodontist are so warm and welcoming and they honestly want to give your child the most beautiful smile possible!!! We have been treated with the most loving and professional hands!!! THANK YOU FOR MAKING THIS EXPERIENCE SO EASY AND AMAZING!!!!! Awesome experience! Our granddaughter just got her braces and the professionalism and sincerity of the staff was wonderful! No one acted rushed - all took their time to make us feel comfortable, well informed and knowledgeable. What a great experience!!! All 3 of my kiddos enjoy being at the office, as it is a very kid friendly & loving environment. Our two eldest daughters have had an excellent experience with Dr. Whitecotton. They both received different treatment plans based on their individual needs and wants (Invisalign for one and braces for the other). They provided flexible hours based on the girls’ busy schedules. Thank you, Dr. Whitecotton and Hamilton team! Loved the kindness and the professionalism! My daughter was very nervous about getting braces on and they walked her through every step of the way by explaining what they were doing and what to expect. April worked with her and explained in detail how to care for them as well as a timeline of what was to come. My daughter left confident in her bottom braces. Because she is having to do hers in steps, she isn't afraid to come back in a couple of weeks. Dr. Whitecotton made sure everything was good, and before leaving Dr. Hamilton looked them over as we were walking out the door. We even received a call later yesterday evening from Dr. Hamilton; not a nurse or an assistant, but a doctor called to check in on her and her pain. He even left a number if needed to contact someone after hours. Would definitely recommend. Dr. Hamilton, Dr. Whitecotton and the entire team at Hamilton Orthodontics set the standard for patient care. As a dental assistant for 25 years, I have seen the beautiful results of their work and would not consider taking my daughter anywhere else for her orthodontic needs. This team is the best of the best! Doctors and staff always go over and beyond their call of duty. Always friendly, kind and eager to help no matter what our issue/concern has been. Anyone looking for an Orthodontist, this is the place. My son has been going there for many years and they have always provided and continue to provide excellent care . Absolutely wonderful orthodontist office! Dr. Hamilton and Dr. Whitecotton are very friendly and knowledgeable. Their staff is excellent and made my daughter feel comfortable from the first visit! I would recommend them to anyone! My 2 daughters and I have used Hamilton Orthodontics for braces. Better service cannot be found! My older daughter had cancer. Dr Hamilton and his staff worked with the oncologist to make adjustments to her immediate treatment plan. He also worked with us to make long term adjustments to her treatment plan to accommodate her treatment and changes. He made us feel like she was the most important person in that office. Meanwhile, I had braces and his staff happily worked with me on appointments while I was her primary care giver. His staff was also wonderfully supportive of adults getting braces. My younger daughter was also treated as a very special patient. The thing is, I think every patient in there feels like family and special. Scheduling is easy for broken brackets and broken wires. Great financing department that understands insurance making it super easy for us to plan accordingly and understand our benefits & payment plans offerred. Can't say enough good things about our experiences. My husband and 3 kids have been or are currently patients of Hamilton Orthodontist. Everyone is always happy to see us and happy to help. The staff is always fun and treats you like family. I wouldn't trust my families ortho needs with anyone else. I love their payment options, they make it affordable to have a beautiful straight smile. All 4 of my family members were tough cases too. Hamilton orthodontist did a great job and made us enjoy every visit. We just love Dr Hamilton. Thank you all!!!! We currently have 2 children in treatment with Dr. Hamilton and Dr. Whitecotton and we can't say enough about the excellent care we receive. From scheduling through finances and actual treatment, all the staff is personable, very accommodating and treats us like family. My children feel completely relaxed and at ease during their appointments. They really take time to help the children understand the changes, adjustments, etc. We are very grateful to have found this office and can't imagine seeing anyone else. I love this practice. The staff is always friendly and kind and they really connect with the kids. We never had to wait and never had a difficult time getting an appointment. We also never had problems with brackets coming off frequently. Dr. Hamilton just recently put braces on our youngest daughter and once again we were so very pleased with the whole process. This is our second time since our oldest also had braces and was a patient with Dr. Hamilton. 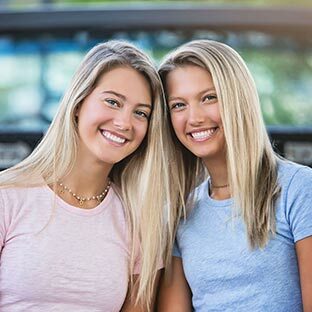 Dr. Hamilton and his entire staff are so kind and considerate and work hard to make you feel at ease throughout the process Both of our girls are very happy with their office and love to go for their checkups. He has such a personal touch, making each child feel so important during their visit, by taking the time to talk to them and show that he really cares. Dr. Hamilton and his staff explain what they are doing, step by step, to the patient and the parent. Every detail is addressed and taken care of. Jennifer, one of his assistants, worked with Madison as she had her braces put on and was truly amazing with her. I cannot say enough good things about her - such a kind and gentle person and explained in detail to Madison about what she was doing and how to care for her new braces. Our visit with Hamilton Orthodontics - for the last two years - have been 100% satisfaction!!! Hamilton Orthodontics is great! Both of my kids have braces through them. Everyone there is friendly, helpful, and most importantly, caring. I give them my highest recommendation! Bar NONE best orthodontist around. Dr H and his staff have a true commitment to each and every patient and their passion for their craft has been obvious every visit. As a 43 yr old mom the decision to get braces was not easy and as a health care provider I have not been the easiest patient- I work out of town and find it difficult to get time for adjustments. Huge shout out to Dr Hamilton and his staff (Thanks Melissa) They recently gave up their lunch to accommodate me. I could not have made a better decision to take this dental journey with any other office. I've had three children go to Dr Hamilton for orthodontics! Dr Hamilton AND the staff are amazing. They will give an honest opinion of what you or your child should have done and explain it clearly. The office is clean and up to date with a fun environment for all ages. We never had to wait to be seen and the staff is friendly and outgoing. They really show that they love their patients and make you forget you're at a dental office. I highly recommend Hamilton Orthodontics! I was a patient about 10 years ago, and couldn't have asked for better results. So of course it is the only place I would take my daughter 2 years ago. Not only do they make you feel like family or their only client, the results are the best anywhere. I worked in a high school for years and I could definitely tell the students who went to Hamilton and those that did not. Not only Does Dr. Hamilton know exactly what he's doing so does every staff member, from the receptionists, to finance, to the technicians. And you can tell by the numbers of years each staff member has worked for Dr. Hamilton, that he must be a pretty great boss to work for. His staff is one of the happiest staff I have ever seen. There is no other place I would rather have have gone and no other place I would recommend than Hamilton Orthodontics. 2 of my children have had there braces done at Hamilton Ortho, we love, love, love it there. Everyone is so sweet and caring. We wouldn't consider going anywhere else!!!! The friendliest people ever! Jett got his braces yesterday and it was a great experience. They answer all your questions, spend all the time needed with you and go over everything in detail. They gave Jett all the tools to help him keep his teeth/braces in good shape (electric toothbrush, mouth wash, toothpaste, wax, flossers and plenty of extra bands). Fun place, great care and wonderful people. We are so happy that we chose Hamilton Orthodontics! Would not go anywhere else. Love this office and staff is above and beyond caring for patients and their families. Had to have an after hours visit and Dr. Whitecotton was very nice and corrected what needed and sent us on our way even as late it was. We love the staff and Drs here. I actually got teary eyed today when my last daughter got her braces removed since we wouldn't been seeing them much. Both daughters and I have had braces here. Each one a different plan. Each experience personal, professional and friendly. Appointments for broken brackets, broken wires, and such are easily made. Everyone there is very supportive of adult braces and the kids. Can't say enough good things about this office and the staff there. EXCELLENT!! Dr. Hamilton, Dr. Whitecotton, Penny and April this office just impressed us beyond words! My daughter started her orthodontic treatment today after over two years of observations and what a wonderful experience she had. EVERYONE, I mean everyone in this office was friendly and smiling. It is so refreshing to see such a happy, healthy working relationship between the doctors and staff!!!! I am blown away by their professionalism and organization. The atmosphere is... fun and relaxing. Thank you Penny and Dr. Hamilton for taking such great care in explaining the process, allowing us to ask questions and never ever making us feel rushed. Thank you April for making my daughter feel comfortable, taking such great gentle care in placing her braces on her teeth and for making sure she was happy and satisfied before exiting your chair. Job well done! I cannot express how much we appreciate you making our first experience much easier with the take home goody bag containing the appropriate electric toothbrush, mouthwash, toothpaste, dental floss, wax, tools and instructions required to help my daughter get a healthy start in maintaining and taking care of her teeth, gums and braces. Not to mention, Dr. Hamilton actually took the time to follow up with a phone call this evening to check in on my daughter, let her know that she did a wonderful job this morning, see how she was feeling and if we had any questions. Thank you for that personal touch, it means more than you know!! THANK YOU to the entire staff at Hamilton Orthodontics! My daughter mentioned this evening that she cannot wait to go back! Sweet! !